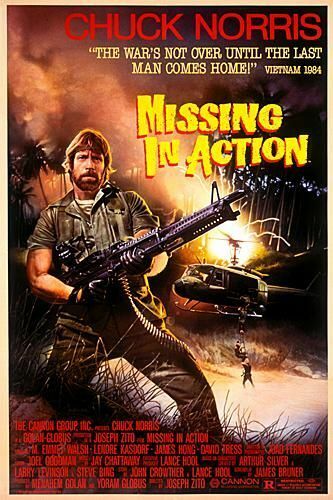 For an action movie, this is surprisingly… Missing in Action? Nice! I’m not exactly tuned into the whole “Chuck Norris” phenomenon. In fact, for a site devoted to reviews of bad movies, one would think that a Norris film should have appeared on here a long time ago. The moment has come at last as I add but one small drop into the vast ocean of Norris celebritology. The subject of discourse is MISSING IN ACTION. Chuck Norris plays “Braddock” a former American POW in the Vietnam War. In the film’s opening minutes we see Braddock, several other U.S. soldiers in co., on the run from the VC. For a good chunk of time I wondered if Norris’ lines were limited to “Come on!” and “Move it!” The action sequence ends with Braddock leaping out of a bungalow, armed grenades in both hands, and landing on a VC soldier—KABOOM! In the film’s present, Braddock has been recruited on a U.S. diplomatic mission to the now-Communist Vietnam to recover U.S. MIAs (suspected to be VC prisoners of war). I suppose the logic was that as a former POW, Braddock would be good for PR. Whoever thought this clearly underestimated Braddock’s hostility towards his former captors. As diplomatic talks break down, Braddock takes matters into his own hands. Using his Special Forces training, he goes about assassinating Vietnamese diplomats and gathering information as to where U.S. soldiers are being secretly held prisoner. The whole point of the movie, and why it surely appealed to hawks of the time, is that no one apparently told Braddock the Vietnam war was over; and furthermore, who needed to win the official conflict when a single soldier like Braddock can massacre VC at his discretion? We totally would have won if only those snaky politicians hadn’t pulled good men like Braddock out of combat! I suppose one can tolerate that if the Vietnamese had been shown any human dimension, but of course like all 80s action movies, they are the “native” fodder for the white man’s machine guns (thanks Richard Dyer). As such, the film is as quietly racist as it is overtly jingoistic. I didn’t really expect different.